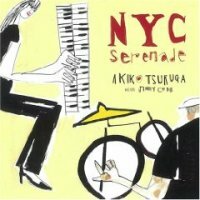 Description: Hammond B-3 player from Osaka, Japan and now a resident in Harlem, New York, Akiko Tsuruga has captured the hearts and minds of both American and Japanese jazz fans. Following St. Louis Blues, her award-winning debut from MOJO Records, she recorded this swinging album with a special trio featuring her idol and legendary drummer, Jimmy Cobb. Young tenor saxophonist Wayne Escoffery appears on more than half of the program. Tsuruga writes in her Japanese liner notes that the theme of this CD was "swing," and she picked the songs she always wanted to play. The program includes somewhat unusual choices for an organ group such as "Arthur's Theme" and "When You Wish Upon A Star," but the band swings in every tune. Tsuruga also shows her compositional skills with two originals: "24 Mill Street" and "Gator's Time," the latter dedicated to tenor saxophonist Willis Jackson. Another wonderful CD by a talented organist: Every tune is filled with groove, swing and joy! Recommended! Produced by Makoto Kimata. Recorded at Systems Two Studios, Brooklyn, New York on May 31 and June 1, 2008.